Assuming the middle initial on the card above is an "H", this was likely the calling card of George Howard Allen of New Sharon, Maine. It was found with a collection of calling cards from that area, including one that belonged to George's brother Joseph Howard Allen, the subject of another post. From brief online research, hopefully correct - corrections and additions requested. 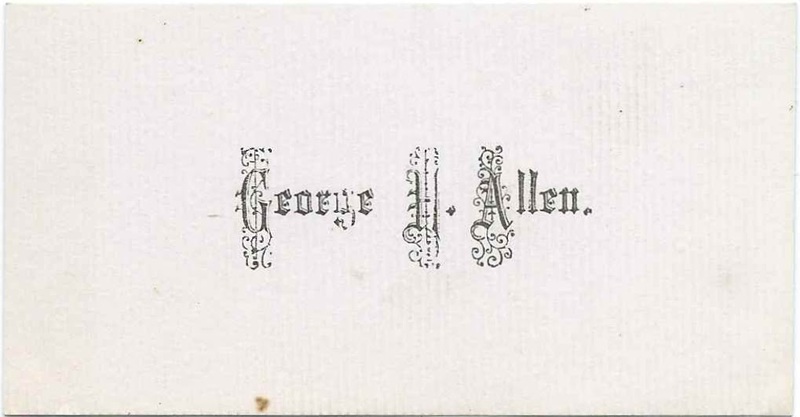 George Howard Allen was born January 5, 1863 at New Sharon, Maine, the son of Benjamin Allen and Eliza Ann (Coombs) Allen. On March 13, 1885 at Farmington Falls, Maine, George married Florence Tufts Clark, daughter of Warren Tufts and Martha Ann (Tarbox) Tufts and adopted daughter of Starling and Palona (Tufts) Clark. Florence was born February 9, 1865, at Farmington, Maine. See another post that features the calling card of Florence Tufts Clark, before her marriage. George, a blacksmith, and Florence had, I believe, five children born in Maine, and then moved to Humboldt County, California. They're buried in the Table Bluff Cemetery at Loleta, California.